Another one of Gerald Genta's iconic creations. The Patek Philippe Nautilus was conceived using the universal shape of a porthole found on most maritime vessels and released just four years after the Audemars Piguet Royal Oak was launched in 1972. Without a doubt, the year 1976 marked a milestone for Patek Philippe with a design that was not conventional and that would help the brand appeal to a younger demographic. Just like on the rest of Genta's creations, the alternating brushed and polished areas on the bezel as well as the flat top cases are part of the design. Patek Philippe commissioned Genta to come up with a design that would compete with the Royal Oak and that would stand the test of time. The end result, the iconic Nautilus. Originally released with its unmistakeable black-blue dial in 1976 as ref. 3700/1 in stainless steel and with the name Nautilus 'Jumbo' due to its large—40mm— case diameter at the time, the Nautilus has established itself as a classic, elegant sports watch from one of the top Haute Horlogerie houses. The Nautilus Annual Calendar with Moon Phase ref. 5726A-001 stays true to the iconic DNA of the Nautilus line while featuring one of our favorite complications, the annual calendar with moon phase. The annual calendar differs from the perpetual calendar in that it does not take into account the additional day that is added to the month of February in leap years —every four years. This is however, a complication that calculates odd and even months and also factors in the 31st day of August. In a nutshell, it is a useful function that avoids the wearer having to adjust his watch every month. The black dial —more graphite grey to the naked eye depending on lighting conditions— features white gold applied markers with luminescent material and the iconic horizontal grooves on its surface. The dial has a very nice layout with double day/month apertures at 12 o'clock and moon phases indicator at 6 o'clock with overlapping 24-hour indicator and date aperture at the bottom. One of the sportiest annual calendars in the market the Patek Philippe Nautilus 5726 is without a doubt one of our favorite watches in the Nautilus family. Fitted with a stainless steel case measuring 40.5 mm in diameter its solid and robust case —just like a porthole—, maintains all aspects of the original Nautilus DNA uncompromised and unaltered. The case band features four correctors to ease the adjustment of the calendar and moon phase functions. The case and bezel, true to its essence, features contrasting high polished and satin brushed finished areas. While the satin brushed finish is superb, we still believe that the satin brushed finish on Audemars Piguet Royal Oaks and Royal Oak Offshores is still a notch above. 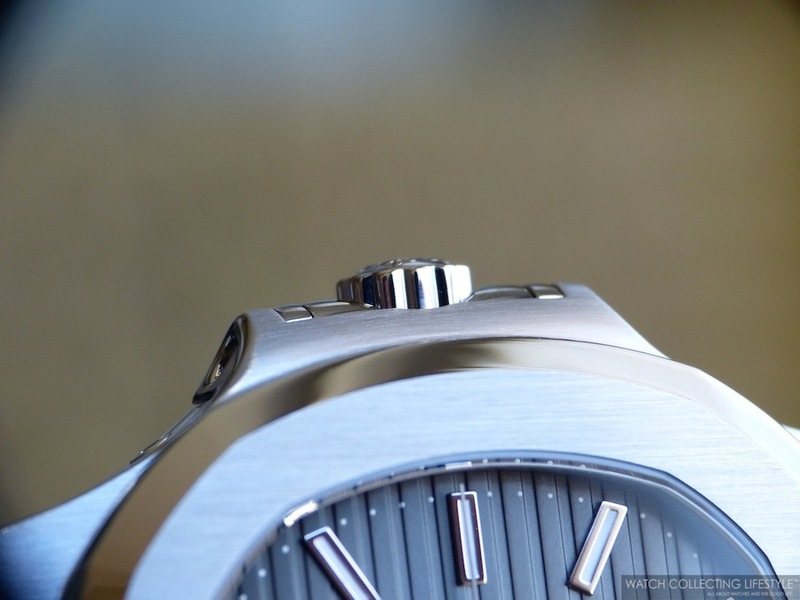 Additionally, the watch features a screw-down crown with the legendary Calatrava cross on it. The Nautilus Annual Calendar with Moon Phase ref. 5726A-001 is powered by the automatic Patek Philippe calibre 324 S QA LU 24H/303 composed of 347 parts, 34 jewels, 10 bridges and which provides a power reserve of 45 hours while beating at a frequency of 28,800 vph. The display case back allows for full view of the calibre and the watch is water resistant to a depth of 120 meters. On the wrist, the Patek Philippe Nautilus reference 5726 wears true to its size and with unparalleled wrist presence. The watch is fitted with a very comfortable hand-stitched matte black alligator strap with rectangular scales and a fold-over clasp. The Patek Philippe ref. 5726 is also available on bracelet as ref. 5726/1A-001 with black dial and as ref. 5726/1A-010 with white dial. Sticker Price $39,500 USD on strap and $44,300 USD on stainless steel bracelet. For more info on Patek click here. Posted on July 18, 2017 by Editor & Publisher and filed under Patek Philippe and tagged Patek Philippe Nautilus ref. 5726/1A-001 Patek Philippe Nautilus Patek Philippe ref. 5726A-001 Mainstream Brands 2017 Patek Philippe Annual Calendars Most Popular Nautilus.